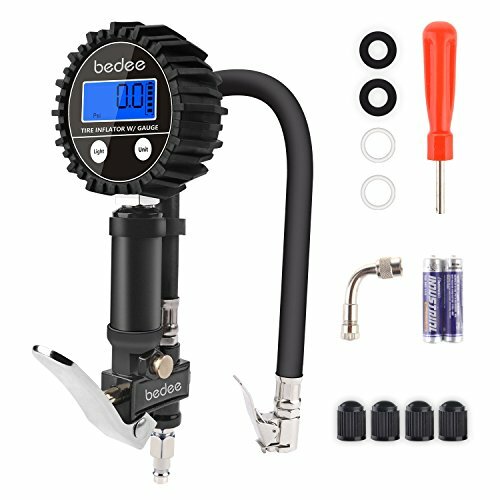 ALL-IN-ONE: The bedee multifunctional auto tire inflator gauge comes with inflating gun, air chuck, gauge, hose, 1/4 \"NPT quick release fitting.Not only a digital tire pressure gauge to measure tire pressure, but also a pressure releaser by simply pressing the built-in air bleeder valve to decrease pressure for overinflated tires. The 1/4\" NPT quick-connect male fitting( make sure it\'s suitable for your air compressor) can connect the air compressor(not included) to add air to your vehicles. HIGH ACCURACY TIRE PRESSURE MONITOR: Professionally calibrated and certified with 1% accuracy and 0.1PSI display resolution, support reading in PSI, Bar,KPa, Kg/cm².Wide exact measurement range:0 ~ 200 PSI, 0 ~ 14 BAR, 0 ~ 14 KG/CM²,0 ~ 1400 KPA.With large LED-backlit screen, you can get clear and accurate reading at day or night. LEAK-PROOF LOCK-ON AIR CHUCK & VALVE EXTENSION: Straight Lock-on Air Chuck provides excellent seal on tire valve outside car tires and frees your hands to operate the pump; The 90-degree valve extender allows the connection of inaccessible tire valve inside the car tire. Perfect to work with different handle clamps. REINFORCED DURABLE QUALITY: Featuring a steel & brass construction,and the handle with integral zinc alloy closure design ensures the robust pressure gauge with better tightness, rust and corrosion resistance. Surrounded by a rubber protector to protect it on bumpy road or drops. The precise tire pressure gauge can work for most vehicles such as car, truck, SUV,off-road vehicle, van, caravans, minibuses,motorcycles,bicycle (with schrader valve) etc. BATTERY POWERED & 1 YEAR WARRANTY: Our bedee Tire Inflator is powered by 2 x AAA 1.5V batteries (included). Automatically turns off backlit after 1 minute of inactivity & 1 more minute to power off to save battery life. We offer you 30 days free return and 12 months money back warranty. 100% satisfaction commitment. Any problem, please contact us directly!